Dr Patrick Randolph-Quinney is a biological anthropologist from the University of the Central Lancashire, Preston, UK, where he is Programme Leader for the MSc in Forensic Anthropology. He has a background in palaeoanthropology and archaeology, and spent much of his early academic life working on the biological and cultural evolution of the genus Homo during the Middle Pleistocene, a critical period that precedes the evolution of our own species and the advent of modern behaviours. He was co-director of field operations at Makapansgat, Limpopo, with a focus on landscape and cave archaeology during the last 500,000 years. In recent years he has been working in the field of forensic anthropology and human identification. He has also continued research into the human evolutionary process, working at the sites of Malapa and Rising Star in South Africa. 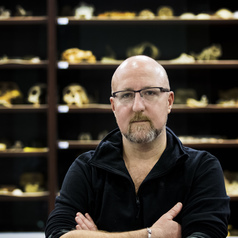 His role in the Rising Star project has been to apply skillsets derived from forensic casework (having worked on homicides, fatal fires and mass graves from war crimes) to the deep past; using the skills from modern forensic taphonomy to understand the context, decompositional environment and mortuary behaviours of Homo naledi. His research also encompasses the effects of disease and trauma on the skeleton, and he has most recently coordinated multi-disciplinary research teams investigating the earliest evidence for neoplastic disease (both tumours and cancers) in the hominin fossil record. He is currently supervising four PhD projects looking at differing aspects of the forensic and palaeosciences. His forensic research focuses on aspects of human identification. His main forensic specialisation is taphonomy (peri and post-mortem processes) with an emphasis on sub-surface burial processes, trauma analysis, and the recovery and analysis of burnt human remains.